Scoring Noise is a free sound library created by Bela D Media and it was the first of its kind. The library was originally released in 2008, but it is now updated with more sounds and once again offered as a free download. It features a set of ambient noises which were captured during recording sessions of various choirs and orchestras. Samples such as these are handy for adding realism to orchestral pieces made with virtual instruments, or for layering on top of other sounds. The original Scoring Noise remains free to subscribers of our newsletter and it will play very nicely along side Scoring Noise Pro – thus giving you even more sound options. 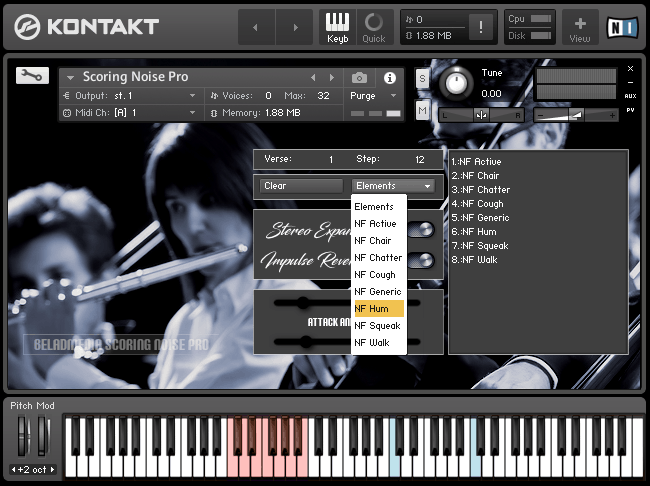 Scoring Noise Pro is a creation of sixteen – 30 second noise floors. The noise floors are divided into categories based on distinguishing characteristic such as a “cough”, or a “chair squeak”, or any other occurrence made by an audience member or performer. Adding realism to your mix! Subscribers of Bela D Media’s newsletter may download a free, 5-second per noise floor Kontakt demo of Scoring Noise Pro. There is no loss of quality or scripting features. To obtain this download, please enter the subscribers page and enter the password provided when signing up to the newsletter.